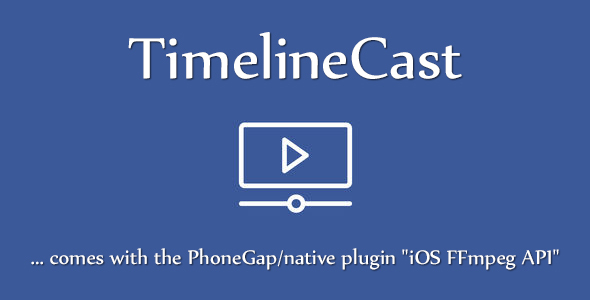 TimelineCast is an application template built on top of Ionic and FFmpeg SDK, that demonstrates how to leverage FFmpeg to stream a pre-recorded video to Facebook Live using the custom PhoneGap/native plugin “FFmpeg API”. Connect & stream live pre-recorded videos from your photo library, Google Drive, Dropbox, iCloud, and any other document service to Facebook Live. – Share your videos instantly live with anyone in a convenient way! – Fully compatible with video files and cloud document services. – Connect and set the appropriate privacy settings. You can share your stream with the public or your friends or the friends of your friends or just you! Your stream is available on your timeline! As mentioned earlier, the plugin can be used in a PhoneGap/Ionic app but also native app may find it more straightforward than alternatives such as pulling build instructions from a GitHub repo.